SCVHistory.com TLP1701 | Tataviam Culture | Marriage License & Cert. : Della F. Cooke & Rudolph N. Rodriguez, 1917. 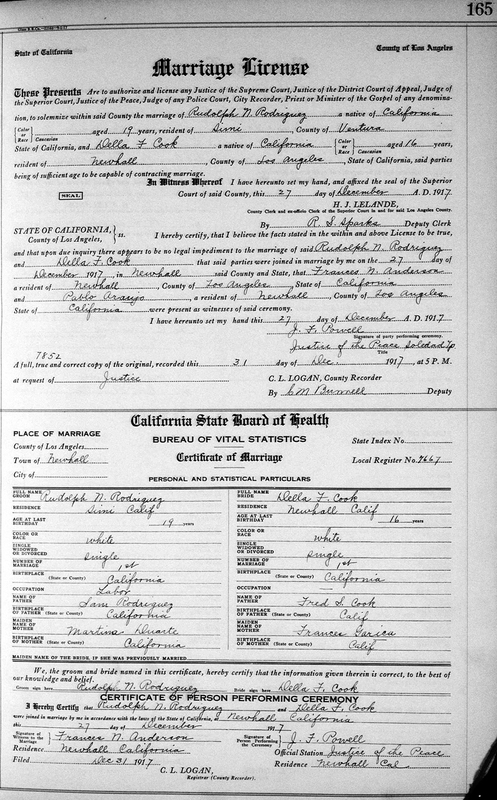 Marriage license (top) and marriage certificate for Della F. Cooke of Newhall (Feb. 9, 1903 - April 3, 1982) and Rudolph N. Rodriguez of Simi (age 19). The couple was joined in matrimony in Newhall on Dec. 27, 1917, by John F. Powell, justice of the peace for Soledad Township (the Santa Clarita Valley and environs). Witnesses were Frances N. Anderson and Pablo Araujo, both of Newhall. Araujo (1866-1947) is buried in the Ruiz-Perea Cemetery in San Francisquito Canyon, along with his wife, Alida Araujo (1856-1941). On her mother's side, Della's ancestry traces to individuals living in the Tataviam Indian village of Chaguayabit (Tsawayung) at Castaic Junction prior to European contact in 1769. On her father's side, Della's father's father's mother was a California Indian born at the Mission San Gabriel. This was the first marriage for both Della and Rudolph. According to Della's relations, in 1928 she married Ignacio "Nels" Martinez. As indicated here, Rudolph was a laborer whose parents, Sam Rodriguez and Martina Duarte (Rodriguez), were born in California. TLP1701: 19200 dpi jpeg courtesy of Tricia Lemon Putnam.